Klimalı lüks dubleks villalarımız, aydınlık geniş ve ihtiyaçlarınıza cevap verecek şekilde dizayn edilmiştir. 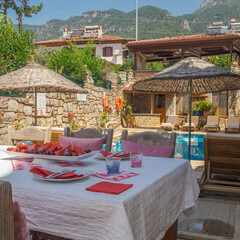 Villalarımız mutfak dahil dayalı döşeli olup yaz kış sizlerin hizmetindedir. Toplam 3 dubleks villadan oluşan sitemizde 1 adet yüzme havuzu bulunmaktadır. Gökova Akyaka, dost ve içten yaklaşımımız, Türk yemekleri ve özel barbekü geceleri, size hoşça vakitler geçirtecek ve tatilinizde her zaman hatırlayacağınız anılarınız olacaktır. 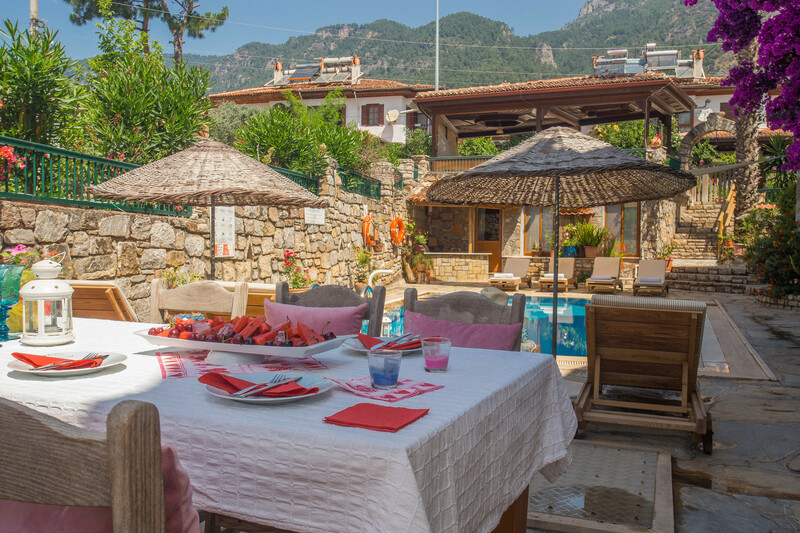 The Villas Vali are ideally located just a 10 minute walk from the beach,village or a selection of riverside restaurants. 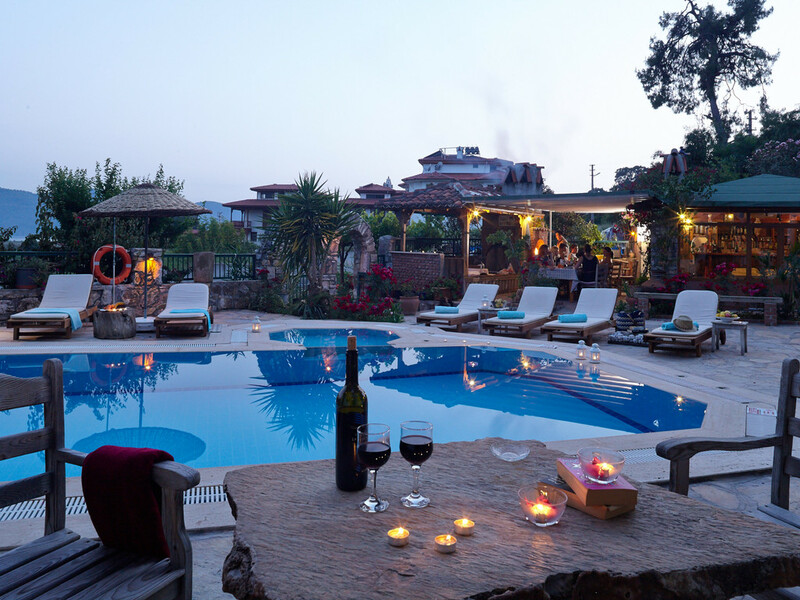 Villas Vali are a group of only 5, two, three and four bedroom villas that share two swimming pools, set in beautiful, relaxing gardens and with views of the sea, Sakar Mountain, citrus and olive groves. 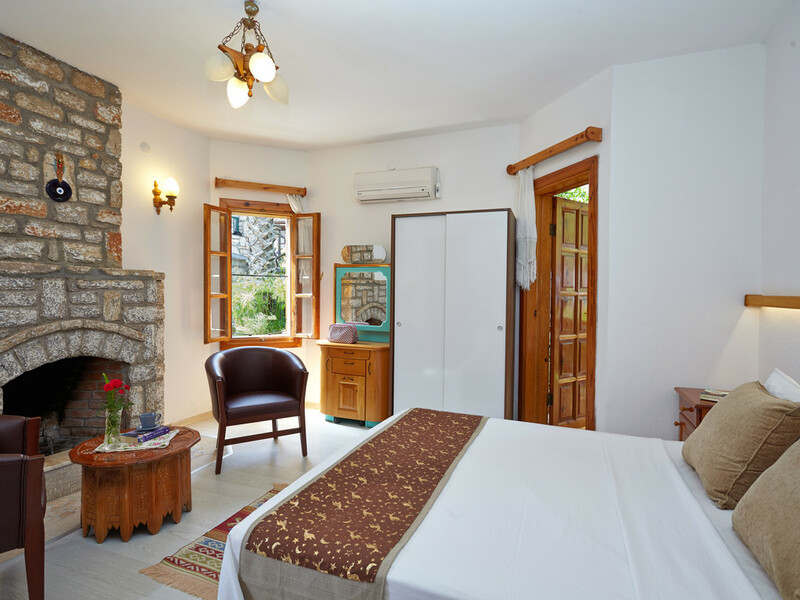 The traditional ‘Mugla’ style architecture combined with true Turkish hospitality makes this the perfect home away from home. 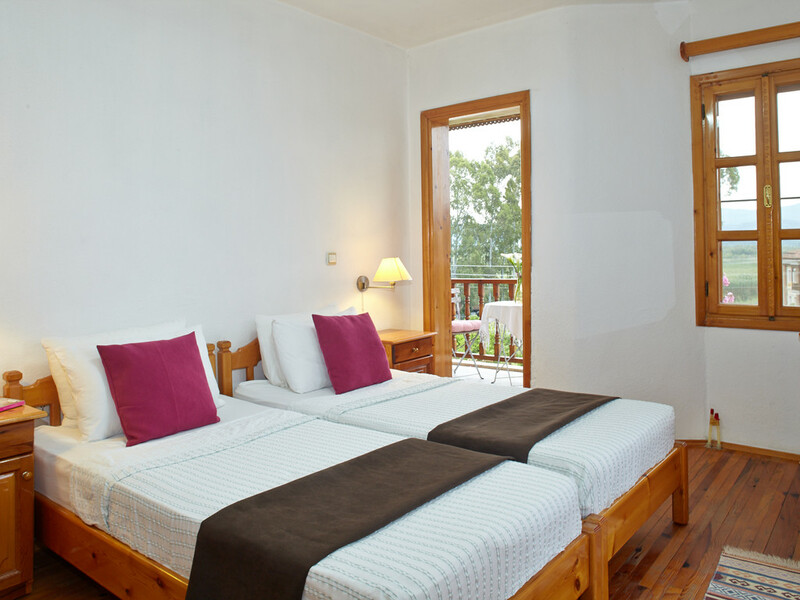 The Villas are well furnished,spacious and well equipped. Mini market two minutes walk. 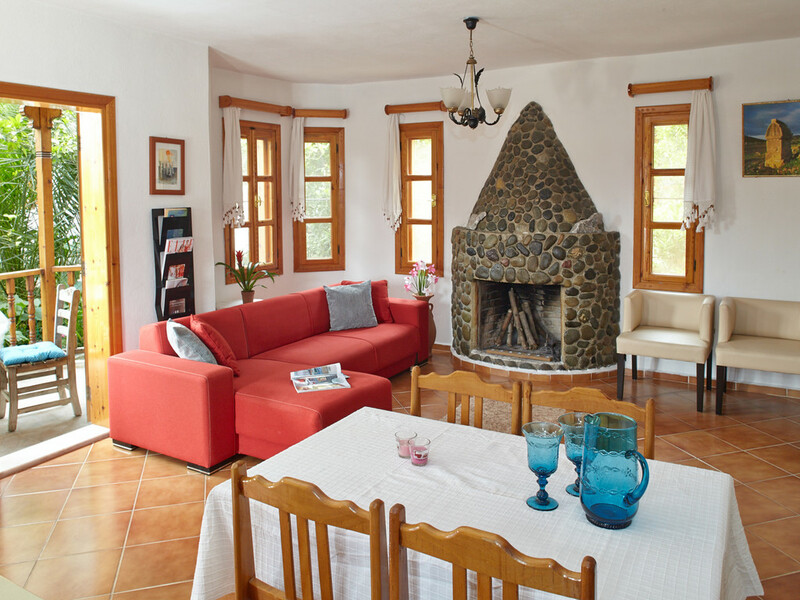 Villa Begonvil is a fully furnished villa with an occupancy of up to four guests. 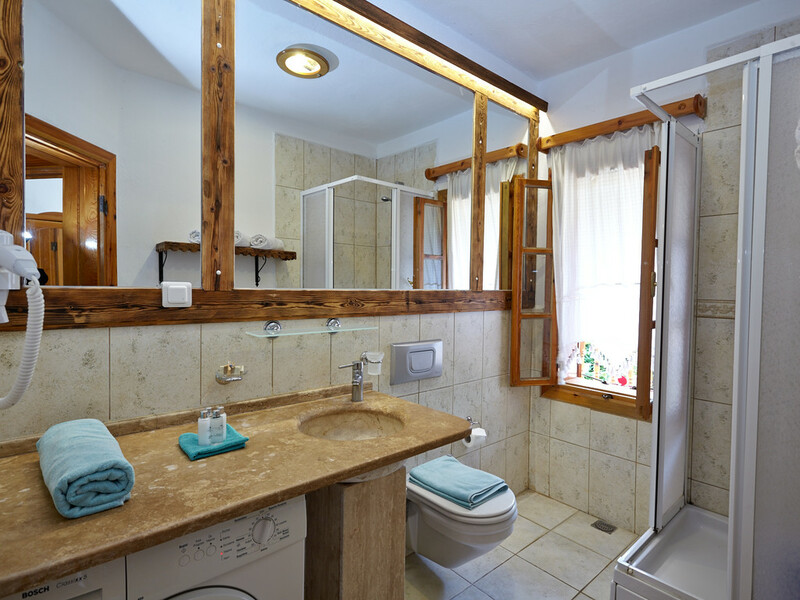 This first floor apartment has a compact lounge plus a kitchenette fully equipped with a small fridge-freezer, gas hob and sink area. 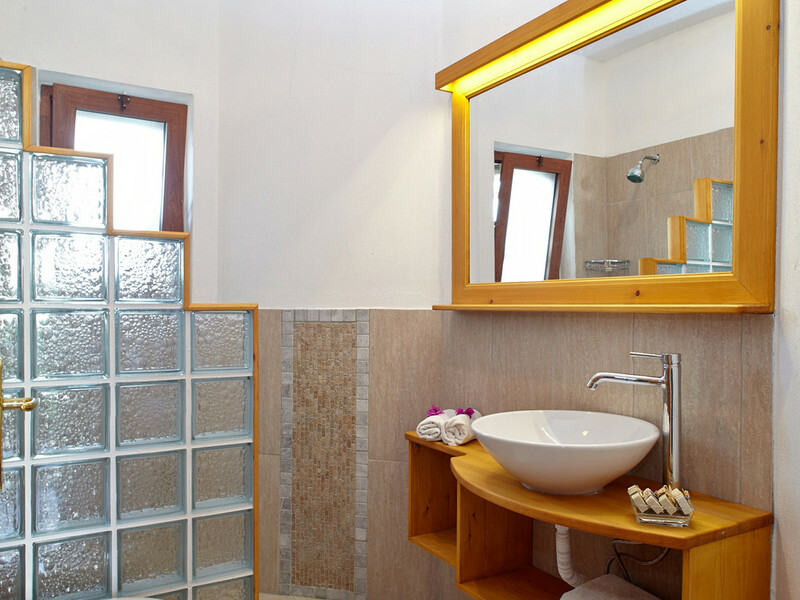 The apartment has a shared bathroom with walk-in shower. 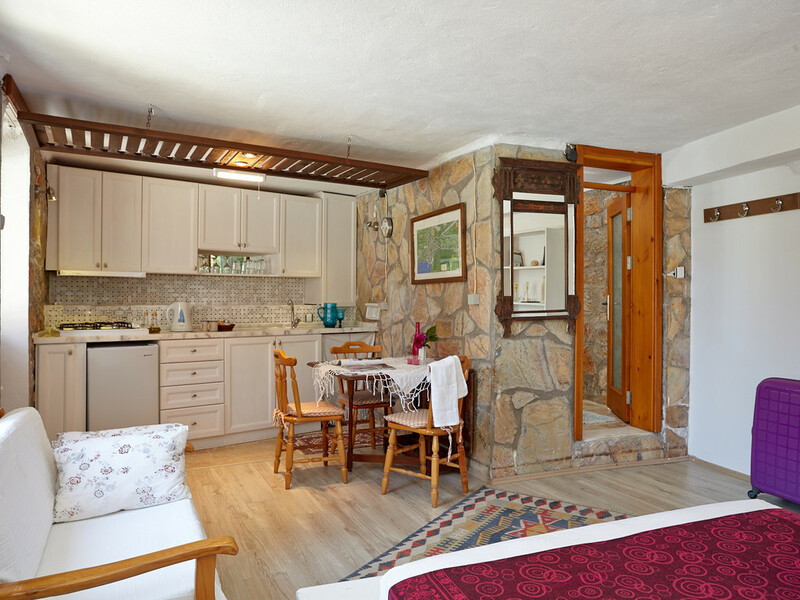 Both bedrooms are decorated in a Turkish style: the double bedroom offers river and garden views and has the advantage of air conditioning whilst the twin bedroom has a balcony with seating for four people.This apartment is ideally suited to people who enjoy outdoor, active or adventure based holidays. 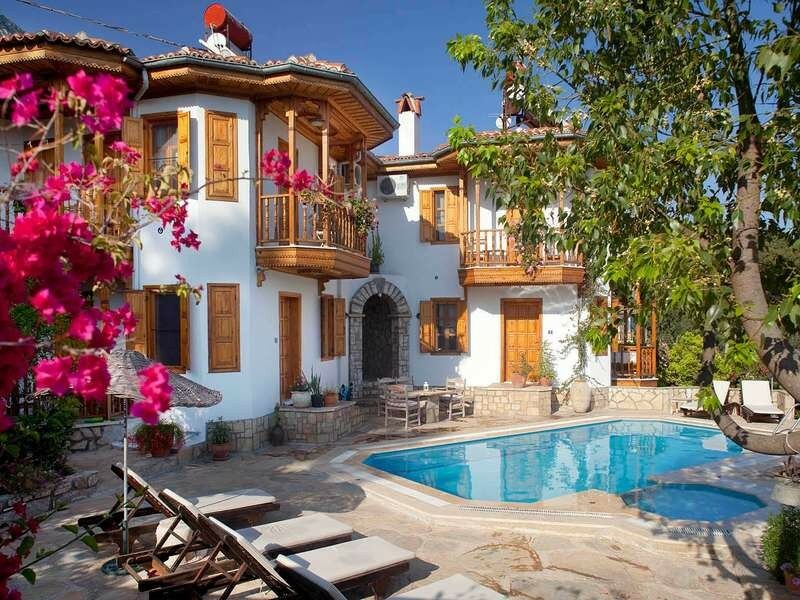 The Villa Vali grounds combine traditional Muğla architecture with modern detail in an idyllic setting. 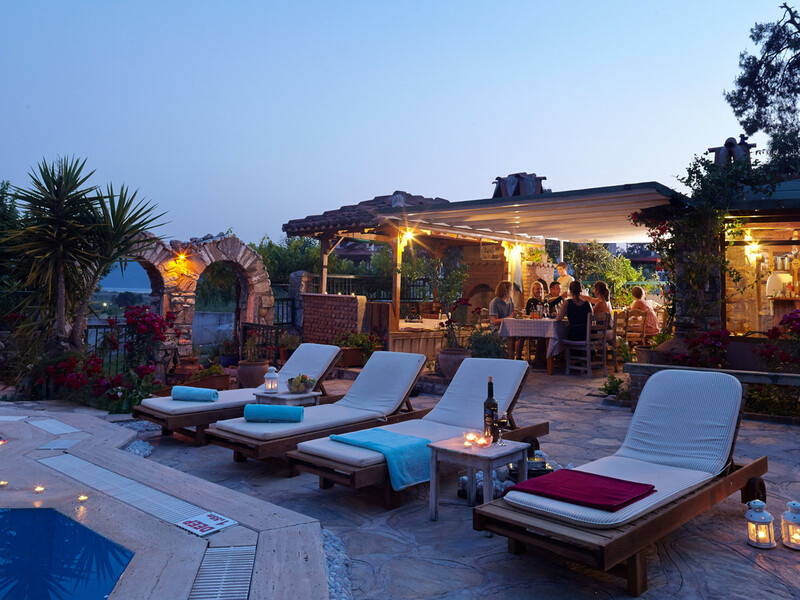 The walled gardens of Villa Vali offer a clandestine retreat that is equipped to meet everyone's needs. 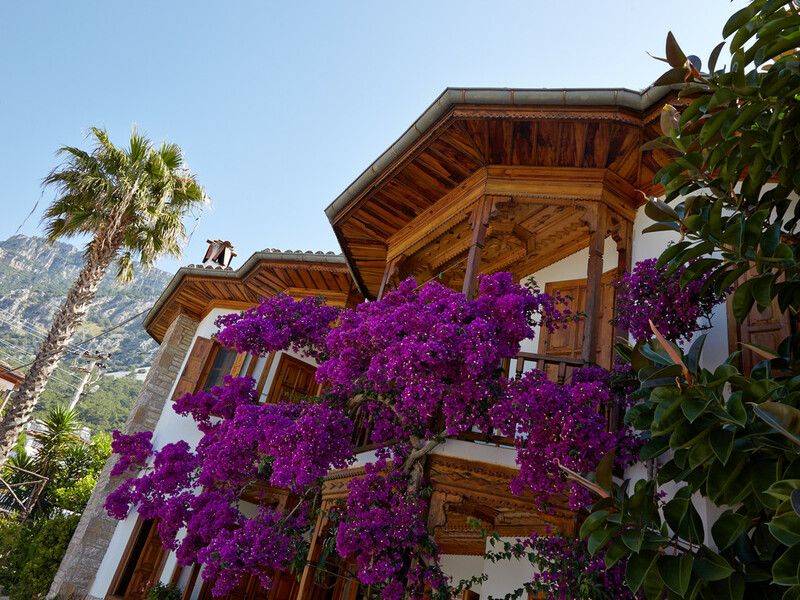 Envisage bright pink bougainvillea tumbling from pine balconies and manicured gardens filled with the scent of semi-tropical flowers whilst unwinding and moving from sunbed to swimming pool in no more than a splash. 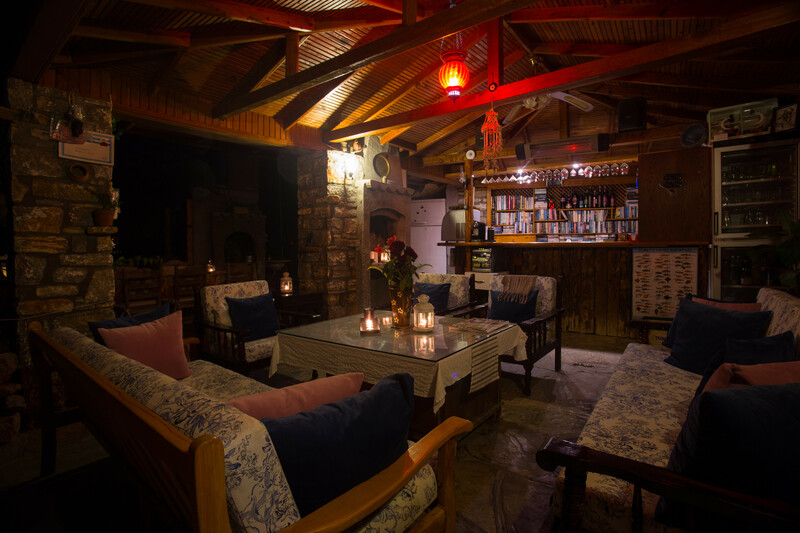 Visualize summer trickling through a sun parasol whilst you decide which cool drink to take from the honesty bar. 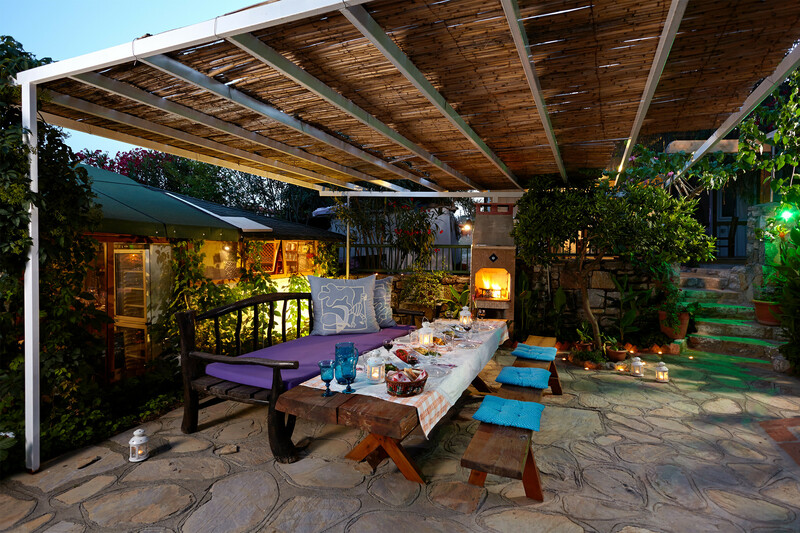 Imagine a place that offers quiet shady alcoves whilst losing yourself in your favourite music or book. 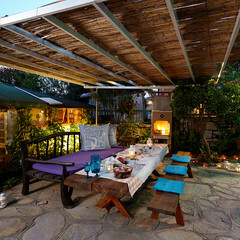 Visualize a classic wooden farmhouse table where you can enjoy a freshly prepared picnic or barbecue al-fresco style. Golden sunsets and sandy dreams are whispering in the onshore breeze and saying believe. 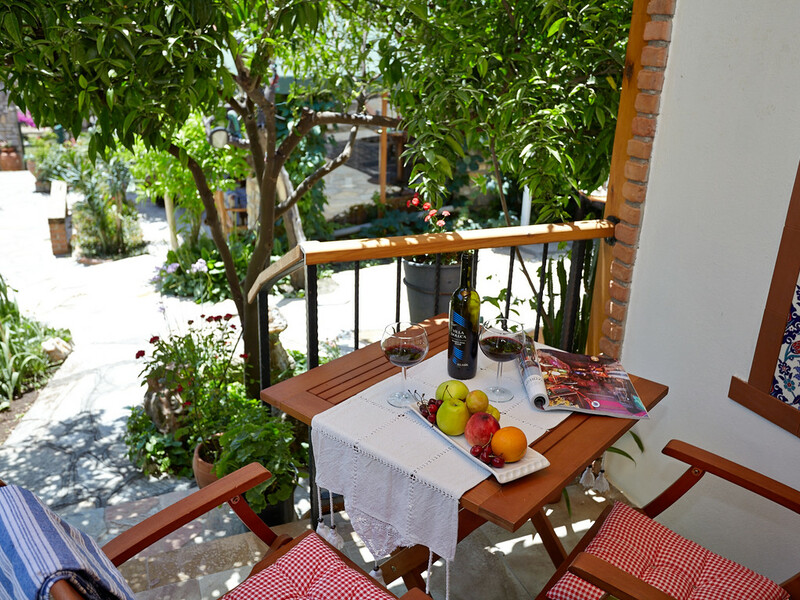 Akyaka has the extraordinary and wonderful ability to leave you speechless and turn you into a story teller. 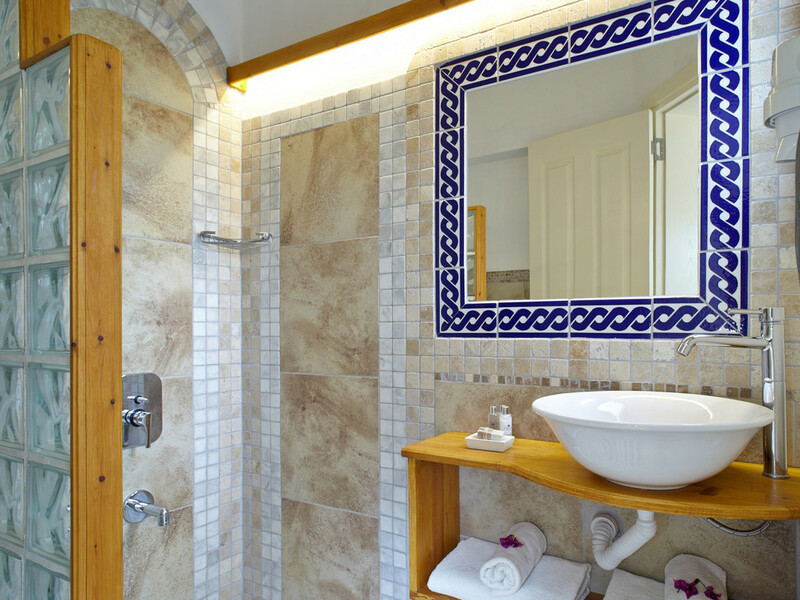 Dream this image and open your eyes to a reality that continues to captivate so many of our guests. 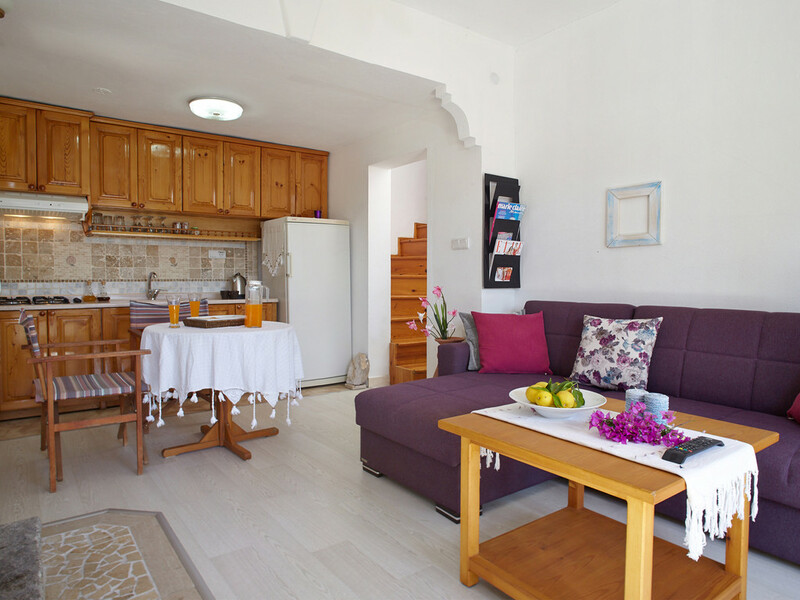 Villa Begonya is a quaint one bedroom ground floor apartment with an occupancy of up to two guests and is ideal for the holiday maker focusing on outdoor living. 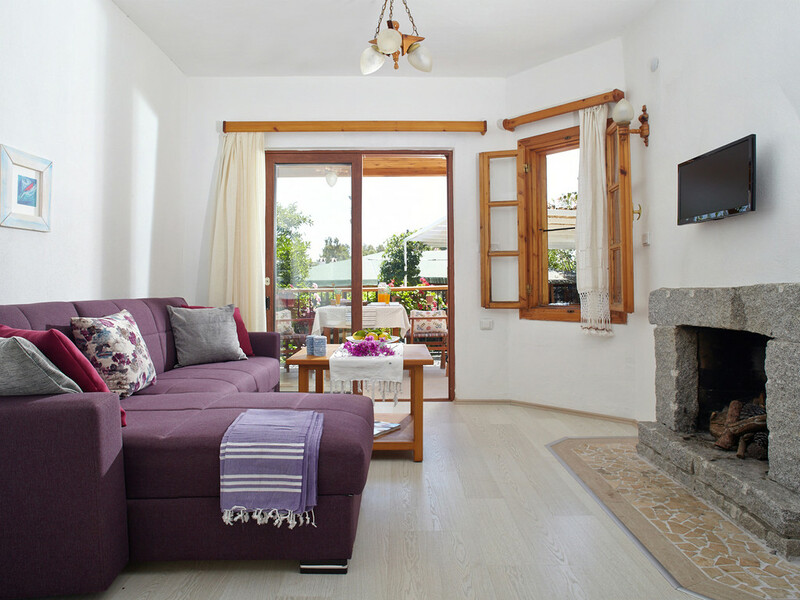 A cosy private terrace leads you to a fully equipped traditionally furnished open plan living and dining area which has a decorative stone fire place for use on cooler nights in spring and autumn. 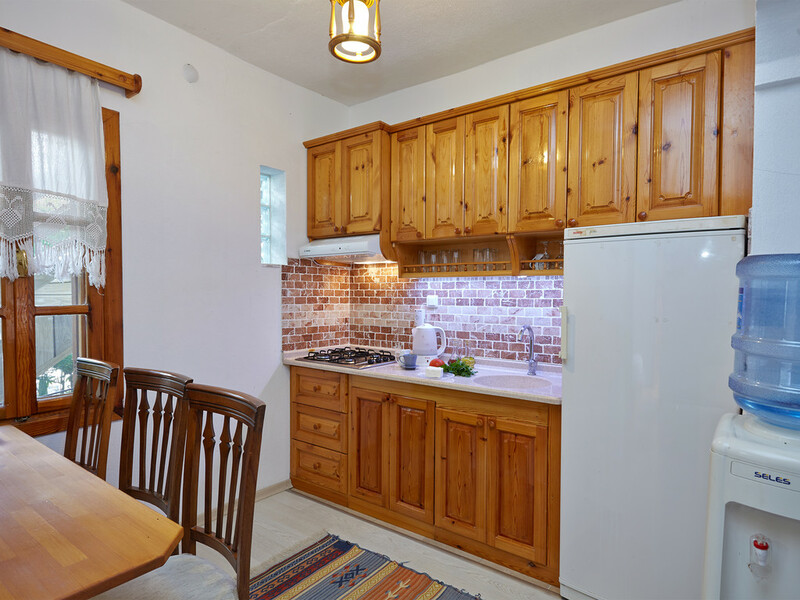 The hand crafted pine kitchenette is fully equipped with a fridge-freezer, gas hob and sink. 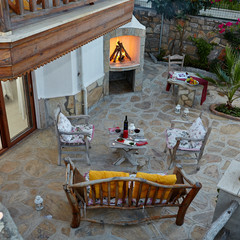 Begonya has one twin bedded room and the apartment has a single bathroom with walk-in shower.This apartment is ideally suited to those who enjoy outdoor, active or adventure based holidays, a couple or friends willing to share.Villa Vali provides deluxe holiday accommodation for Kite Boarders, Kiteboarding or Kite Surfers. Being 3 km. long, with max 50 cm depth in 150 meters makes this calm sandy beach a top ranked in kite-boarders' choice. 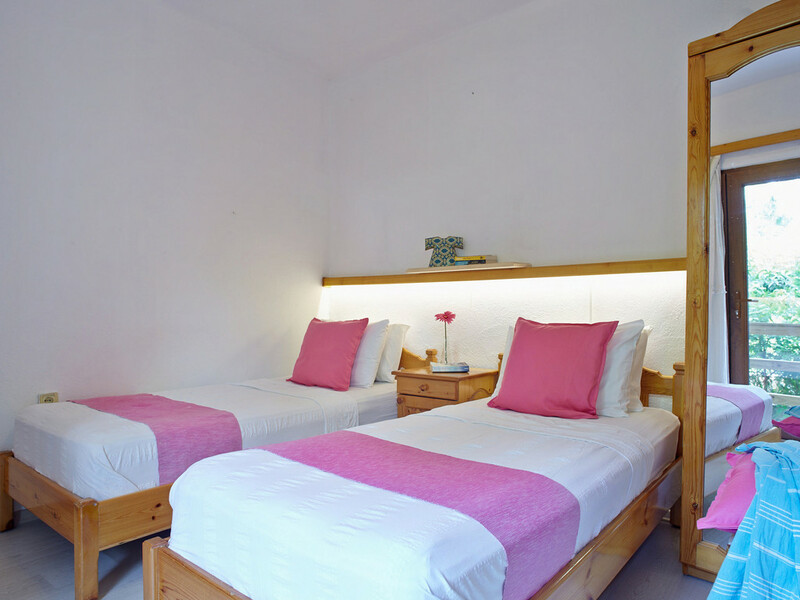 Whether you come here to join a kiteboard course or just for some relaxing sessions on your own, we can arrange your accommodation and transfers. 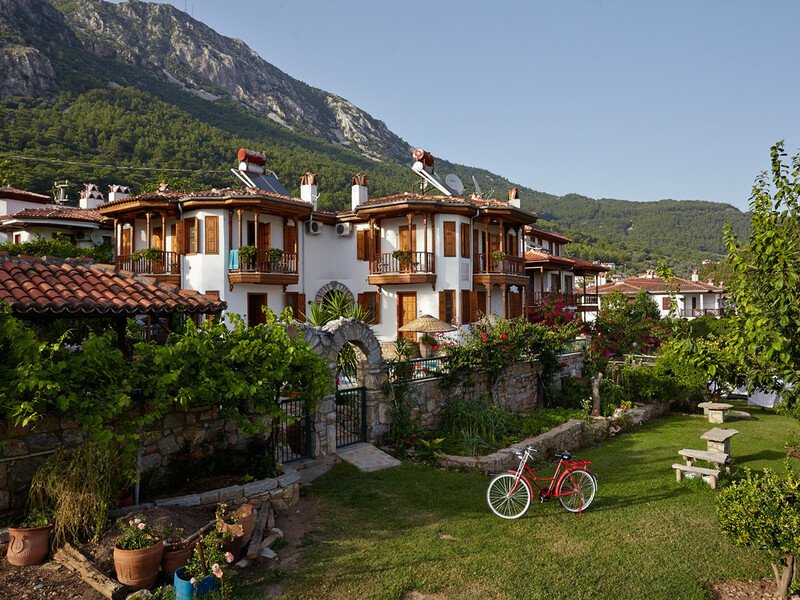 The steady wind in Gokova Bay starts in April when the weather temperature gets warmer and continues its rate until November. There is almost no windless day during this 7 months period of the year.The wind starts as a calm sea-breeze at around 9 a.m. and increases up to 18-20 knot with the influx of air temperature.There are hardly any gusty winds in Gokova Bay which is another reason why this area is such a splendid place for beginners and those who want to improve their kite boarding practice.Even though Akyaka is a wonderful place to just sit and do nothing, on occasions the urge may hit you to go explore further afield. 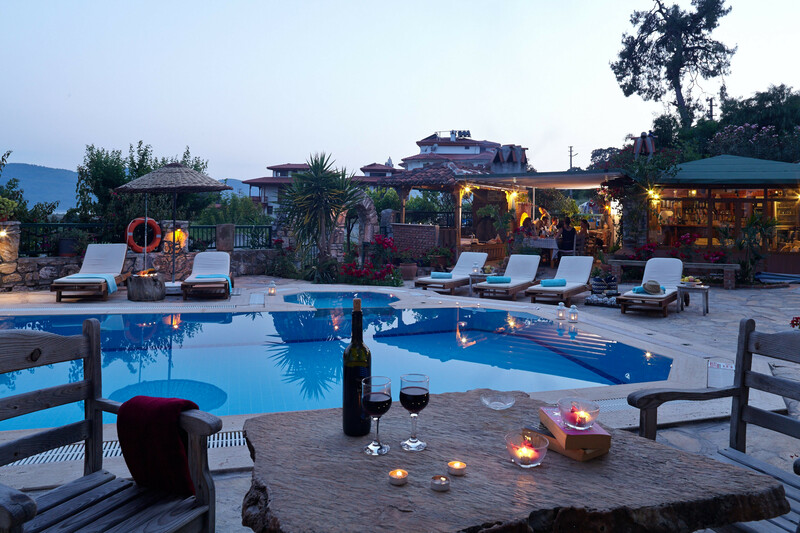 Known to Turkish people as Green Marmaris (Yeşil Marmaris) because of its pine- and olive-clad mountains, the resort city of Marmaris is set on a broad mountained bay 45 minutes away from Akyaka. 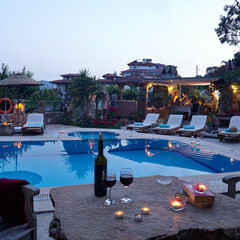 Marmaris is among Turkey's most popular seaside resorts for foreign tourists coming on packaged holidays. 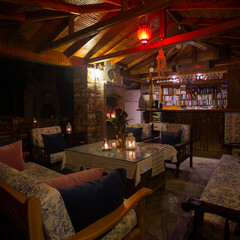 They fill the town's many hotels small and large, promenade along its palm-lined waterfront, set out on jeep safaris and yacht cruises, partake in for water sports, laze on the beaches, and have a fun packed time. 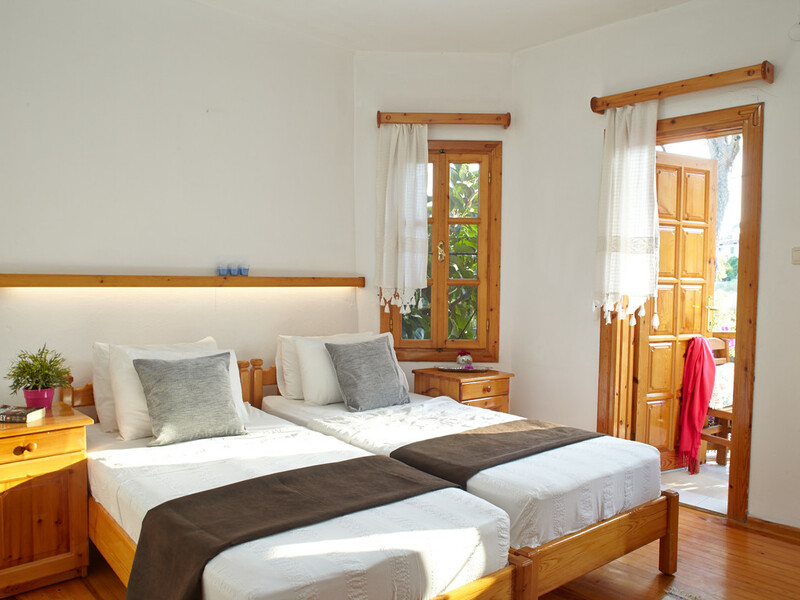 Villa Serce is a ground floor studio apartment which sleeps up to two guests. 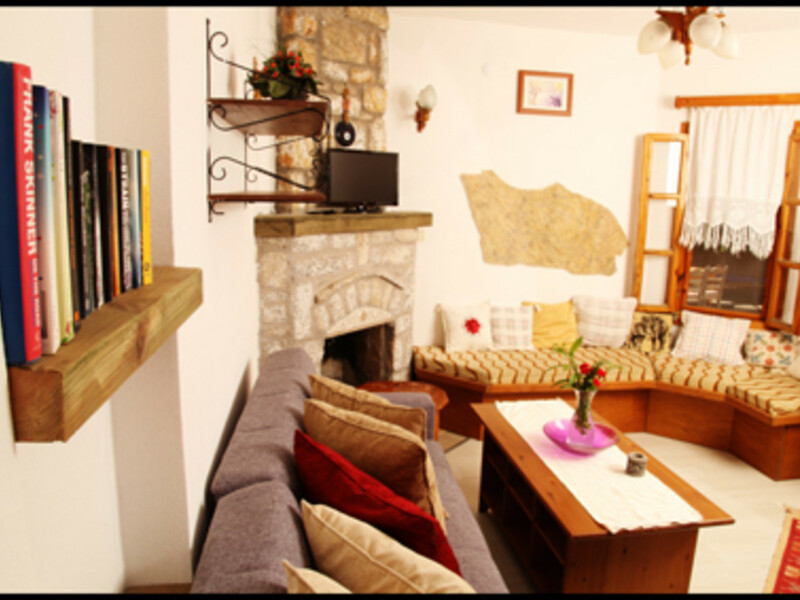 The open plan living area is lined with locally sourced stone studio bringing natures colours indoors. 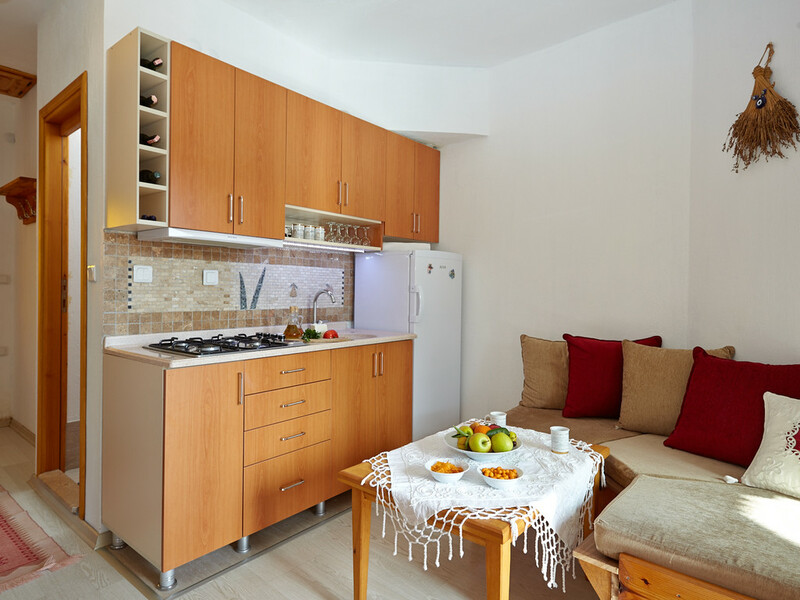 The modern white kitchenette carries all necessary amenities and is equipped with a large fridge-freezer, gas hob and sink. 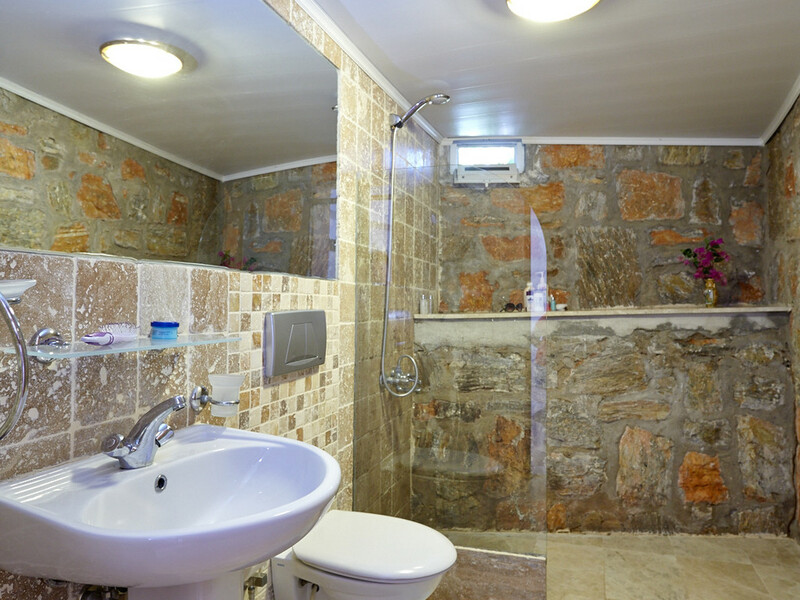 The studio has a bathroom with a spacious walk in shower facility: this room too features natural stone walls. 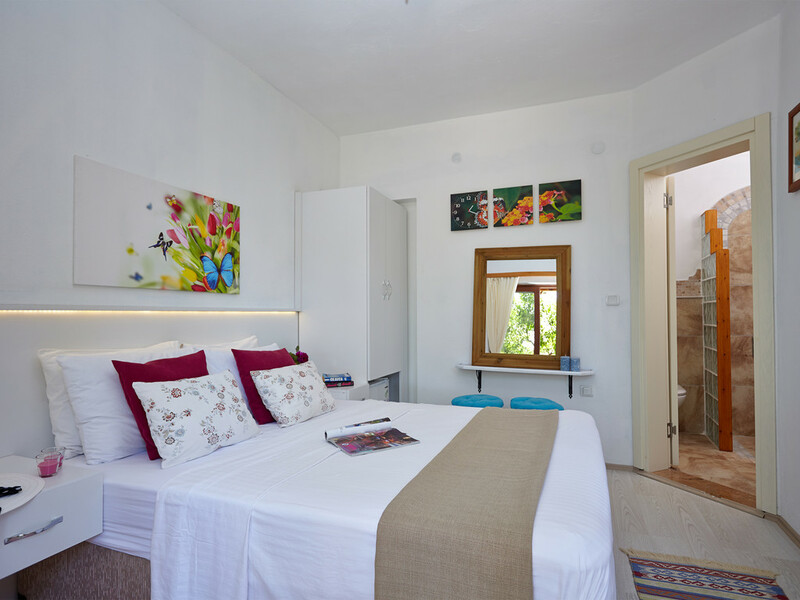 Moving through the studio you reach the bedroom area, tastefully decorated in white with a bespoke double bed. 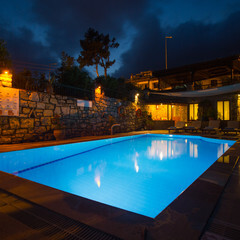 From the bedroom windows you look our onto one of the sites swimming pools. 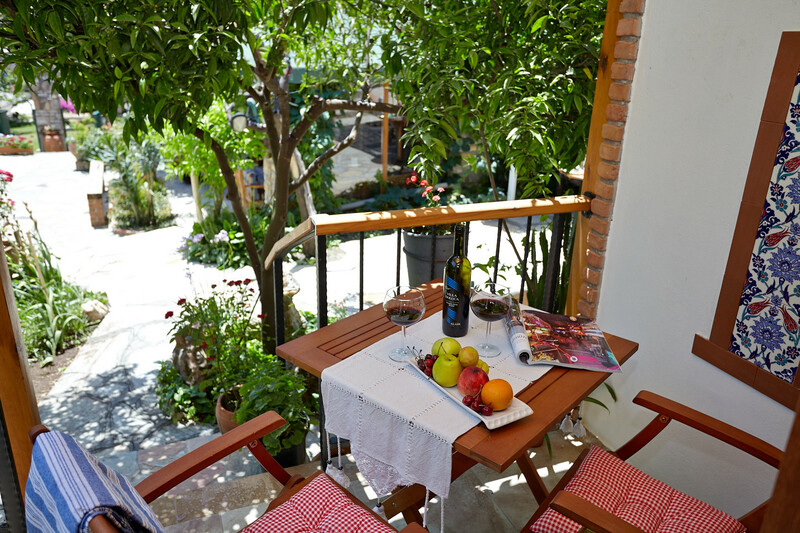 Outside, this studio has its own private terrace area, a table for two and a pool view. 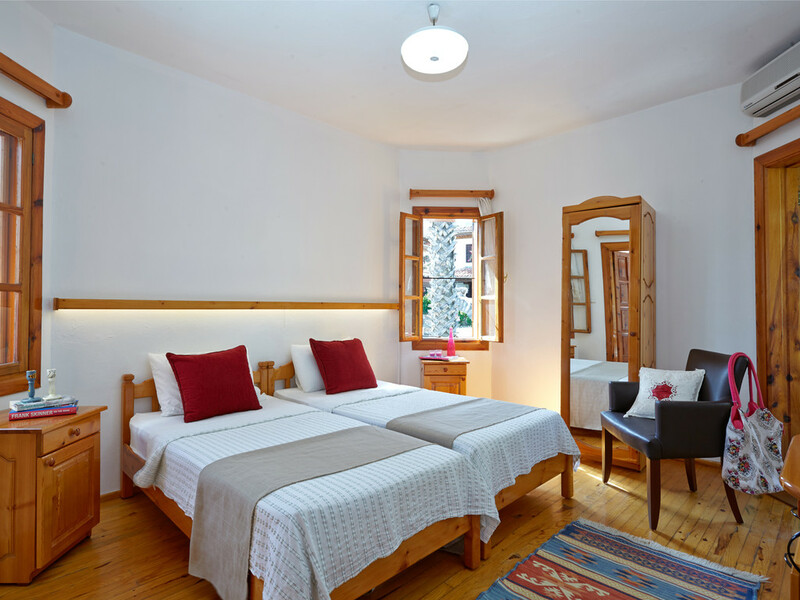 This apartment is ideal for couples.Akyaka has an advantageous geography and offers constant wind starting in the morning and getting stronger as the sun gets higher. With its 3 km long, shallow, clean and sandy coast line Gökova is a relaxing and comfortable base for windsurfing beginners whilst offering more challenging options for those having a higher experience level. Motorized water sports are forbidden in the bay it this ensures a very safe environment for all water sports.Even though Akyaka is a wonderful place to just sit and do nothing, on occasions the urge may hit you to go explore further afield. 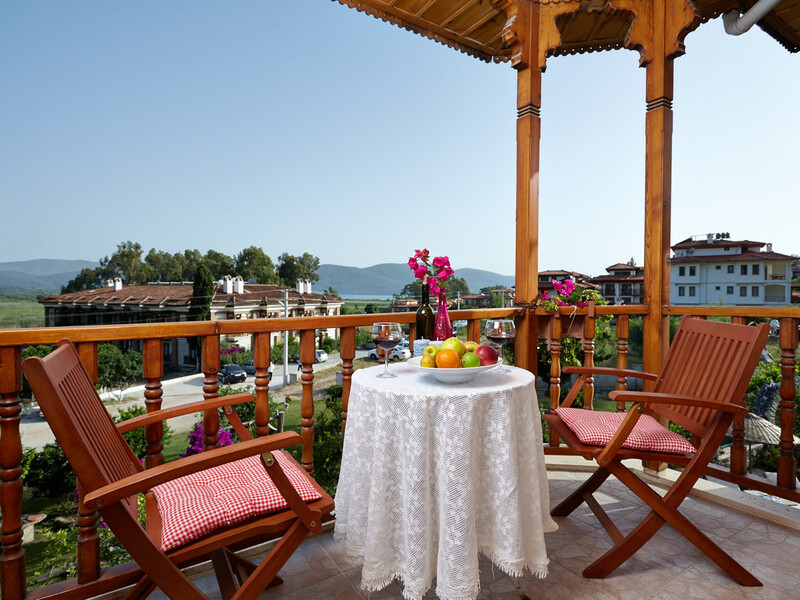 Bozburun is a small seaside town and has a small population of about 2000. 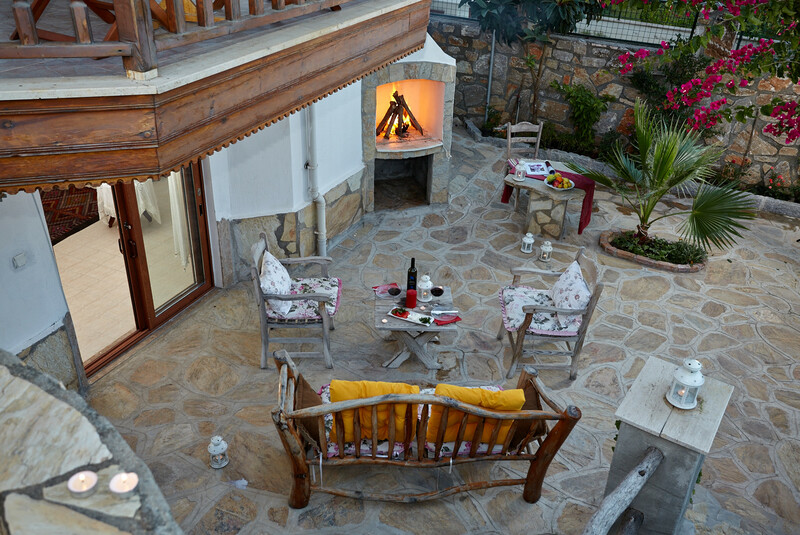 It is situated on the coast of the peninsula of the same name (Bozburun Peninsula) which extends in parallel to Datça Peninsula in the south. 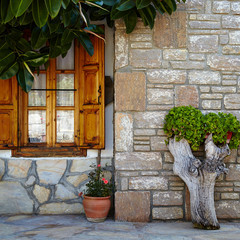 The town faces across the sea the town of Datça and the Greek island of Symi. 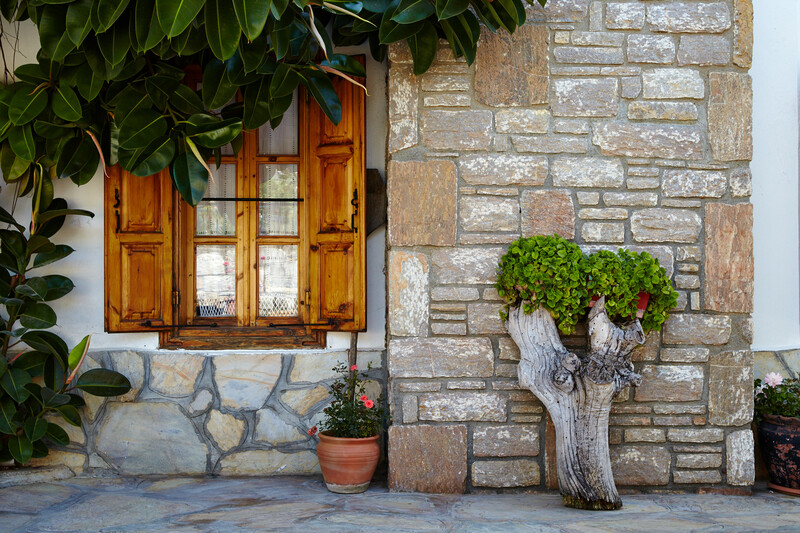 This sleepy village is known by the yachting and gulet community and has a small harbour lined with traditional Turkish and seafood restaurants. 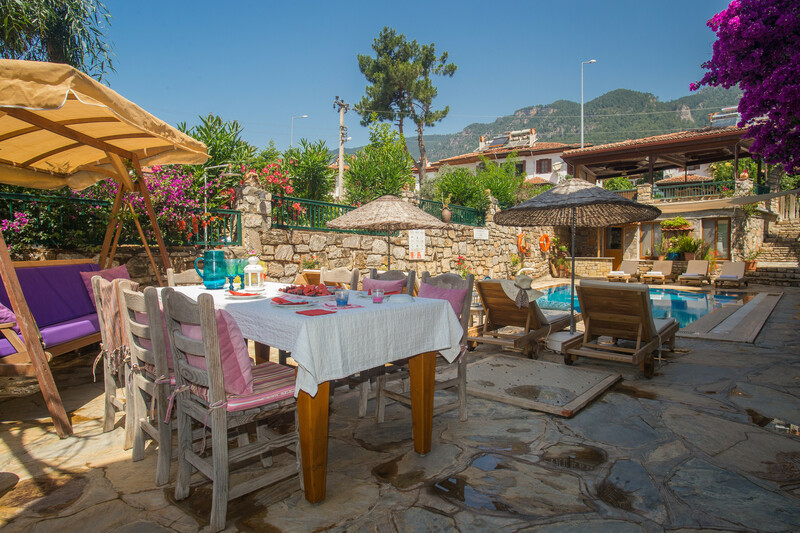 Villa Cevahir is a two bedroomed ground floor apartment and is designed for up to four guests. 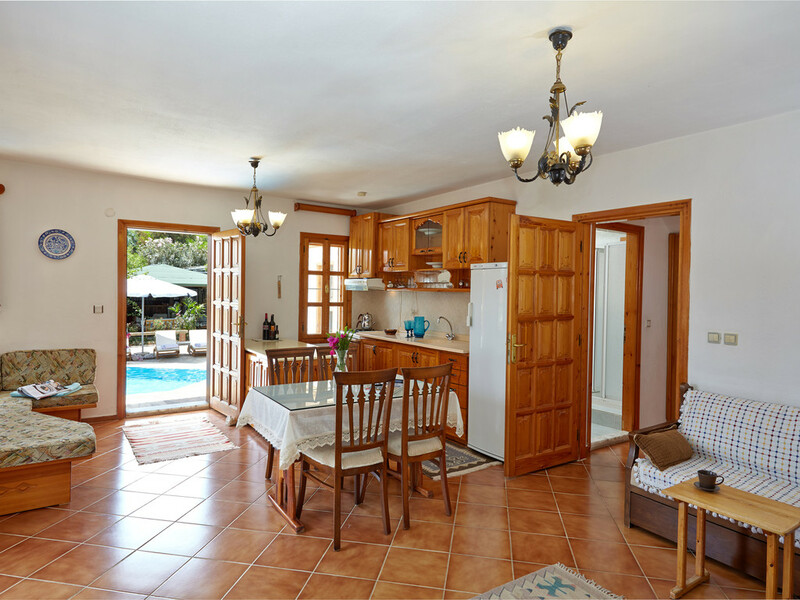 The open plan lounge and kitchen area is pleasing to the eye combining traditional pine fittings with modern fixtures and furnishing. 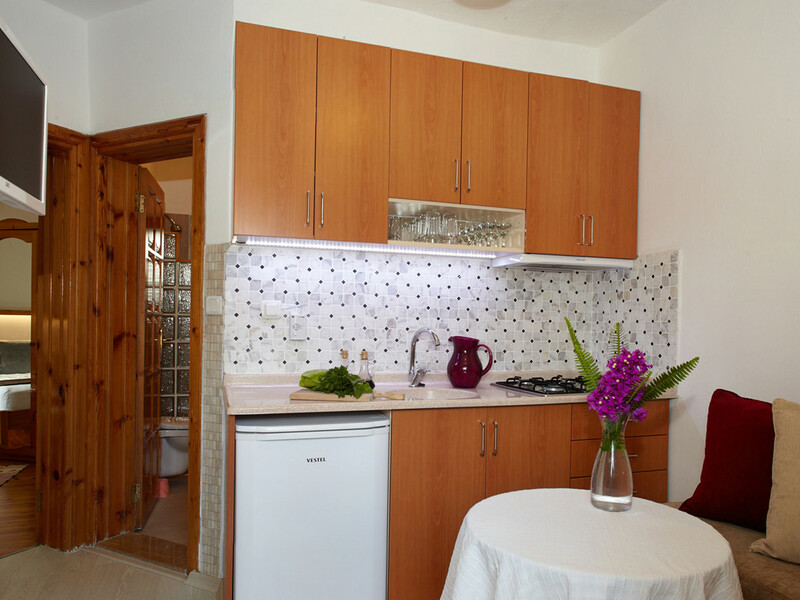 The kitchenette is fully functional and is equipped with a large fridge-freezer, gas hob and sink. 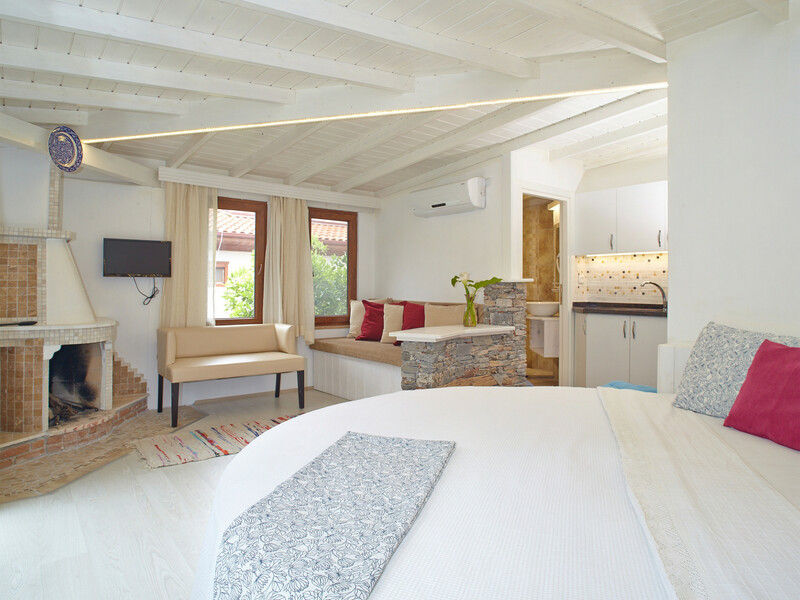 The master bedroom leads from the lounge and is spacious, luxurious, romantic and elegant: the focal point being a beautifully fashioned stone fireplace perfect for cooler evenings. 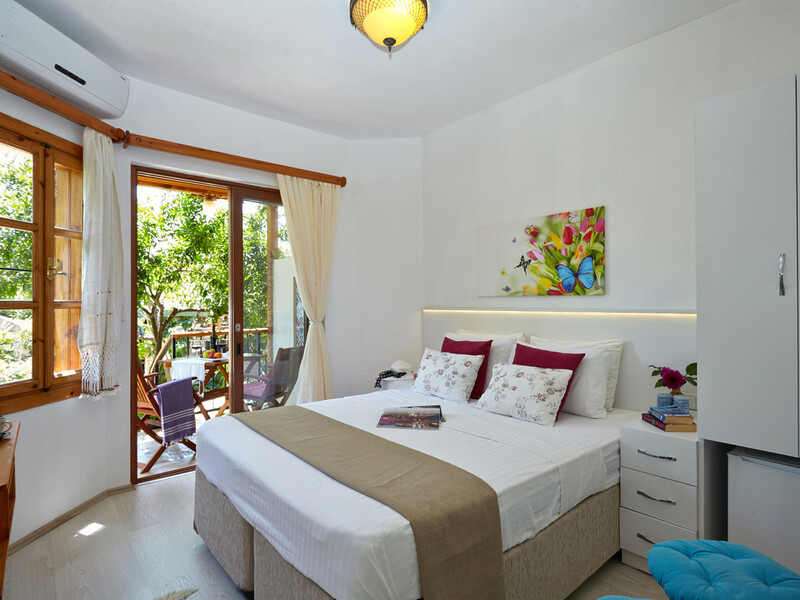 This bedroom opens onto a private terrace for two and overlooks the beautifully maintained gardens of the estate. 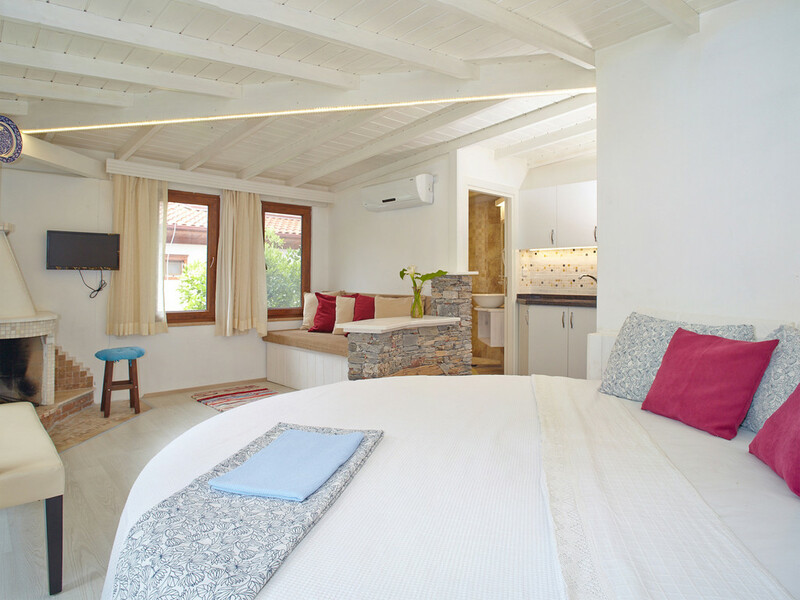 The twin bedroom, also leading from the living area, is equally desirable and continues the traditional pine theme that runs throughout: it also offers a private terrace. 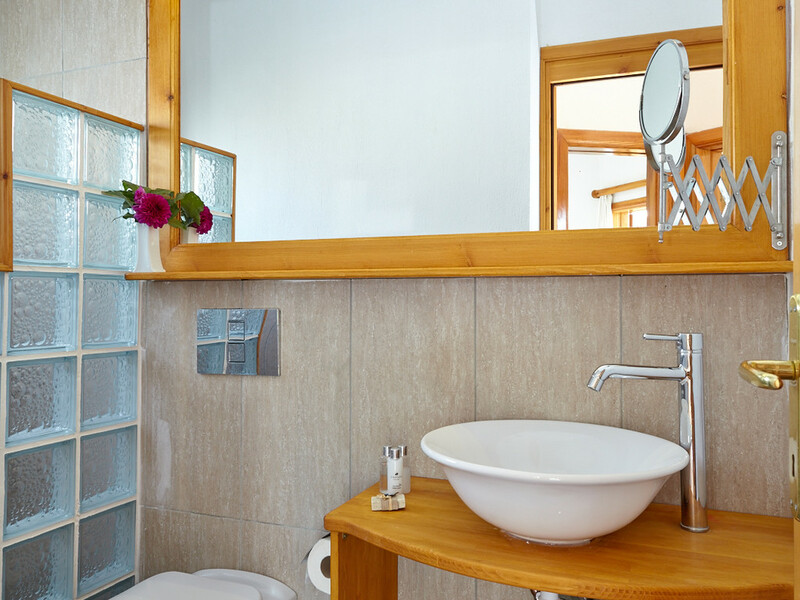 This apartment has a shared bathroom which is modern and fashionably furnished in marble and ceramic tiles and has a large glass panelled shower cubicle. 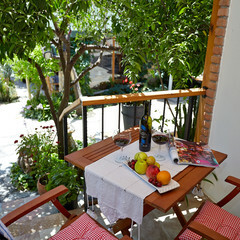 This apartment is ideal for couples or a family with two children.Akyaka is a region of outstanding natural beauty. 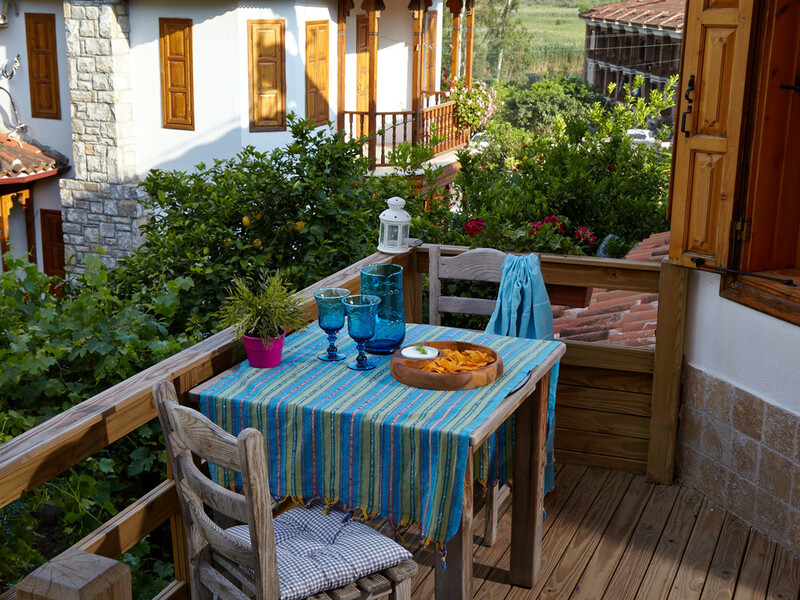 The Azmak River flows on the lower boundary of this unspoiled village: the crystal clear waters are a natural aquariuım and flow quickly from its spring source through trees and reed beds towards the Gulf of Gökova. The beauty of the river can be enjoyed by a walk against its banks or by boat. 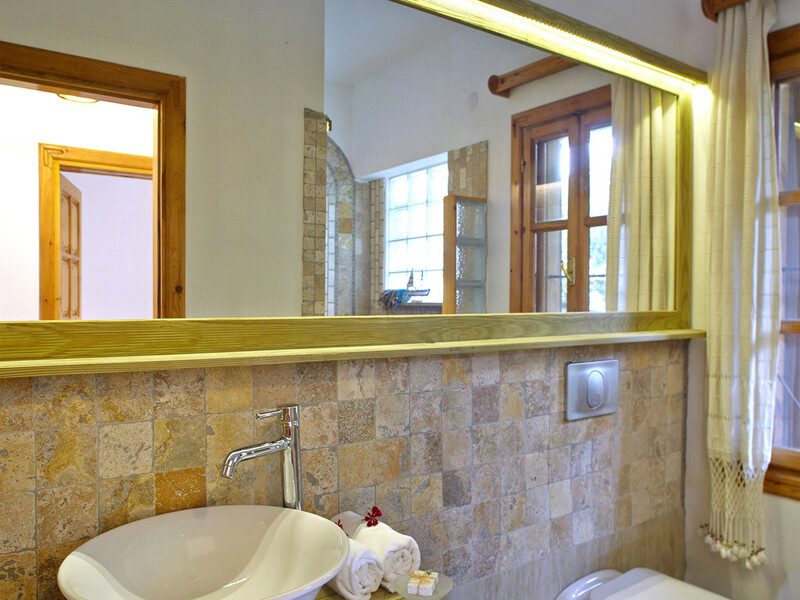 Take pleasure in the beauty of the river's colourful pebble basin and the wildlife that is abundant: fish, tortoises, ducks, kingfishers and the protected fish otters that bring this idyllic ecosystem to life. Fish restaurants line the banks of the River Azmak. 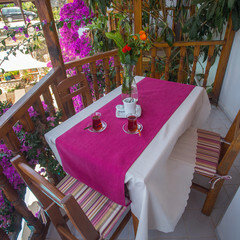 In the morning choose a traditional Turkish breakfast and watch dragonflies dance across the water or in the evening sample locally produced organic vegetable “meze” starters and delicious fish courses. 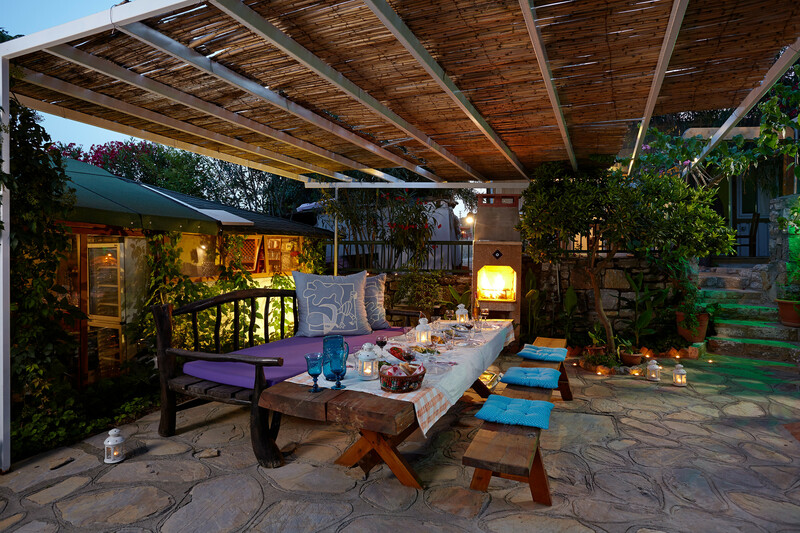 These well known restaurants offer a truly cosmopolitan cuisine to the most discerning of travellers.Even though Akyaka is a wonderful place to just sit and do nothing, on occasions the urge may hit you to go explore further afield. 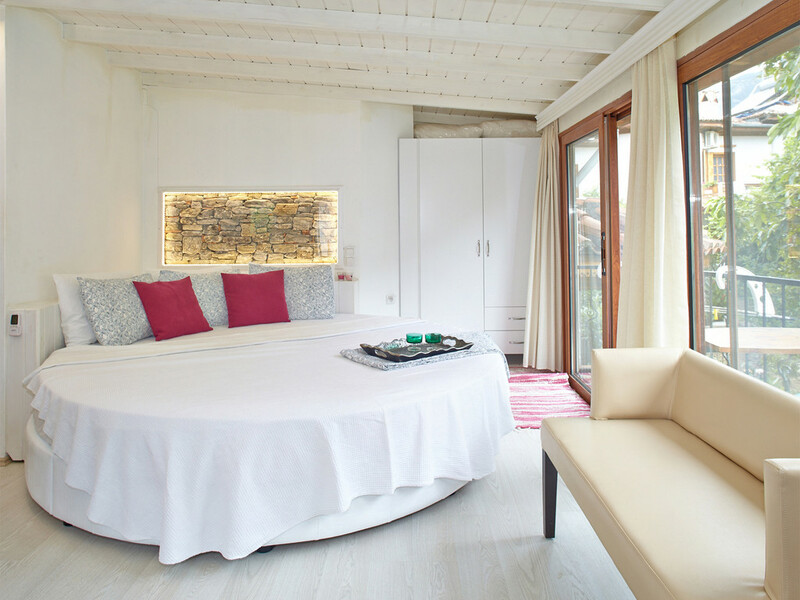 The Villa Vali family will help you discover the hidden Akyaka and the magic of the region. 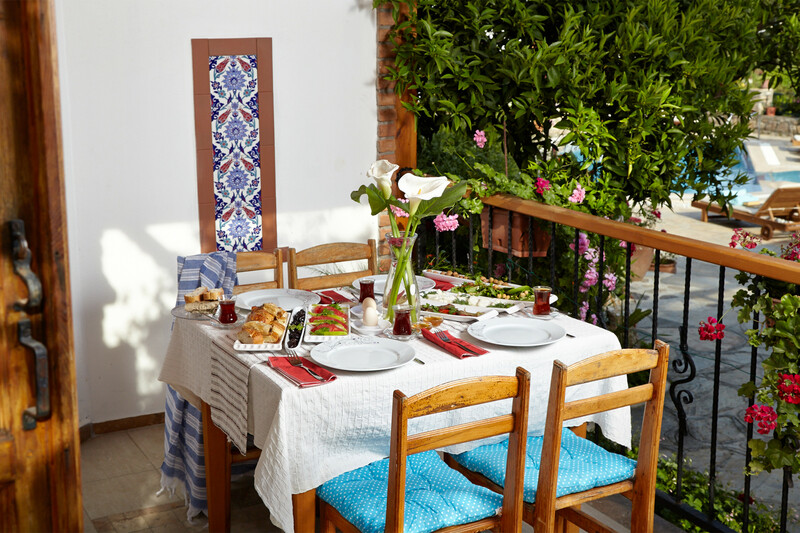 Check out Mugla market for local wares and produce where you can pick up a range of souvenirs at reasonable prices. 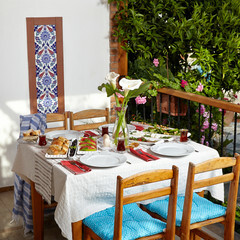 In Turkey particularly good value items to take home are lokum (Turkish Delight), honey, pistachio nuts, sunflower seeds, peppercorns, pepper grinders, dried herbs, apple tea, stalks of sage and camomile tea, tea glasses. Also leather wallets, handbags, belts, woven tablecloths, ceramic ware, gold and silver and traditionally woven carpets and kilims (in specialist shops). Don't forget to barter prices for the best bargains! Take time to visit Zahire Pazaar which is overlooked by an old-town mosque and features lazy cafes spilling across a leafy cloistered courtyard dotted with traditional craft shops: the city subsidizes their rent to maintain traditions such as marbled paper and art, hand-woven items and intricate painted boxes. 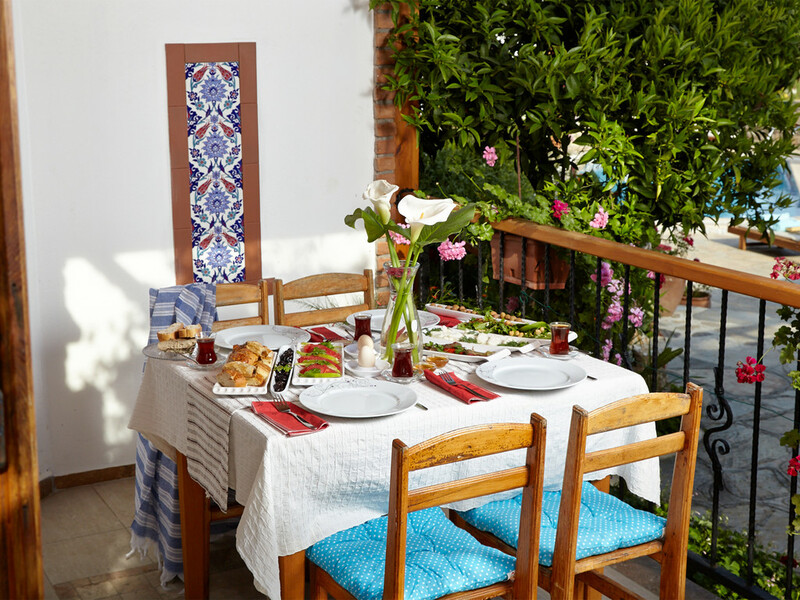 Even if you're not shopping for crafts make an opportunity to sample an atmospheric drink of cooling home-made lemonade, traditional Turkish tea, refreshing ayran or creamy salep. 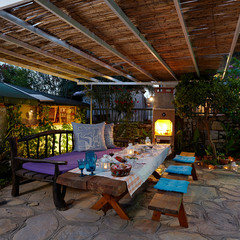 As the sun sets choose from a selection of tobacco flavours and smoke from a nargile pipe: a great way to slow life down and relax. 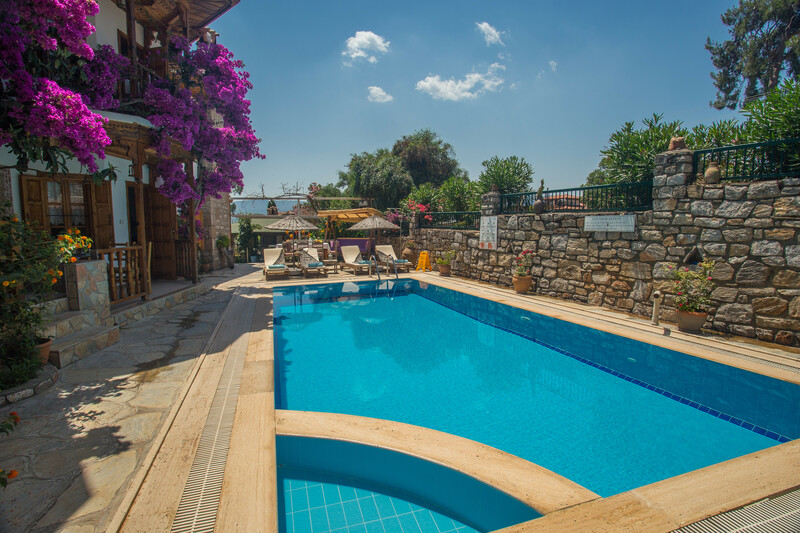 Villa Azmak is a two bedroomed villa for up to four guests purposely designed to make you slow down and enjoy summer. 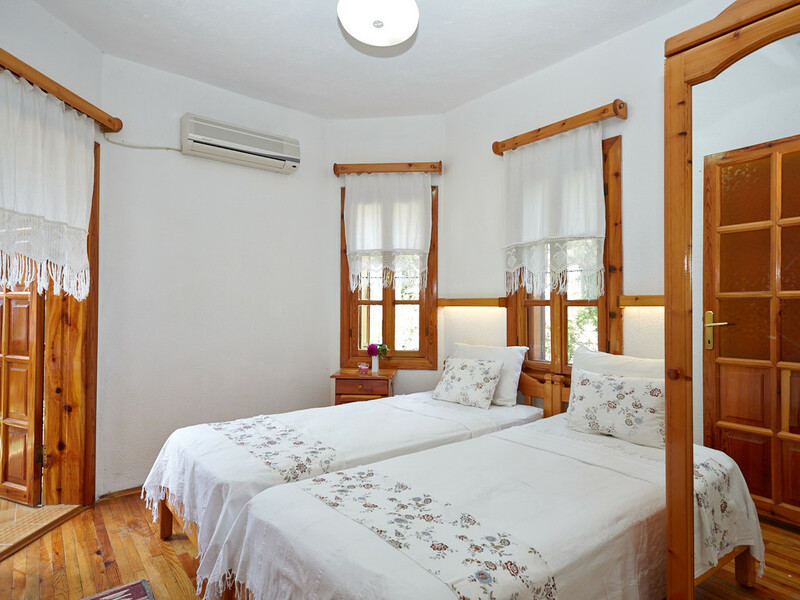 The interior is tastefully decorated throughout in a traditional Turkish style. Via a private terrace the ground floor offers a comfortable uncluttered open plan lounge with feature stone fireplace leading on to a bespoke pine kitchenette equipped with a fridge-freezer, gas hob and sink area. 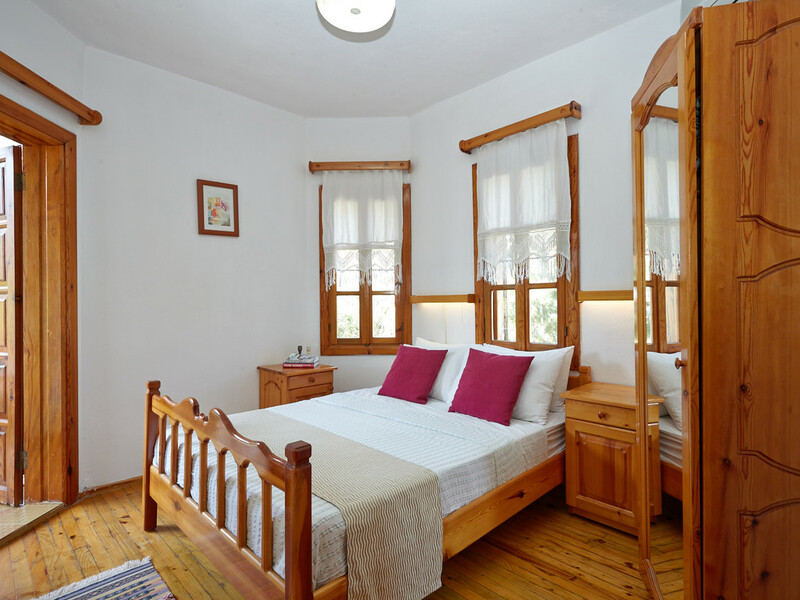 The pine staircase leads upstairs to two traditionally furnished bedrooms with air conditioning and a shared bathroom and shower. 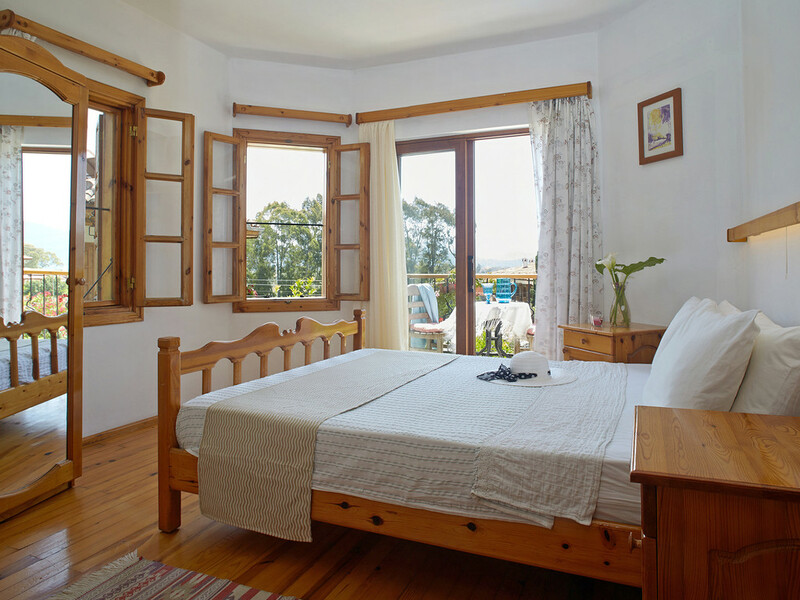 The master and the twin bedroom both have a private balcony area: the master bedroom enjoys a panoramic view of mountains and the Aegean Sea and the twin room beautiful views of the gardens and grounds. 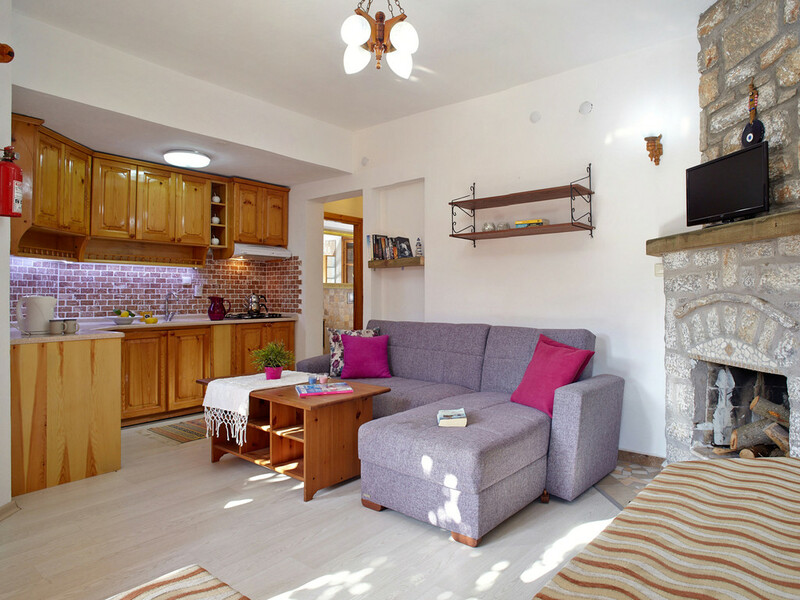 This apartment is ideal for couples or a family with two children.Want something more adventurous on holiday? Akyaka's rock climbing routes are near Çinar Beach, 2 km from Akyaka and offer a unparalleled view over the a scenery of Gökova Gulf. There are 7 routes in different grades that you can learn or practice rock climbing in every level. Canyoning in Toparlar is a must on those hot summer days. 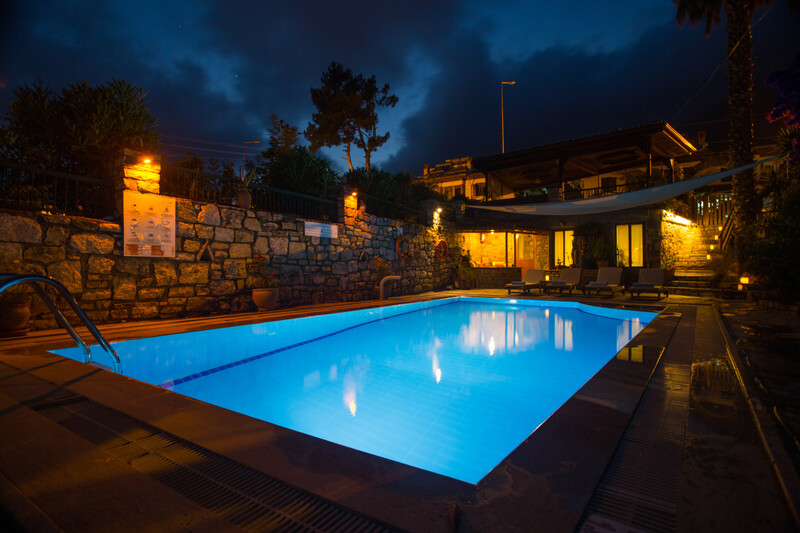 This activity is suitable for those in relatively good physical condition, who can swim and who likes water! 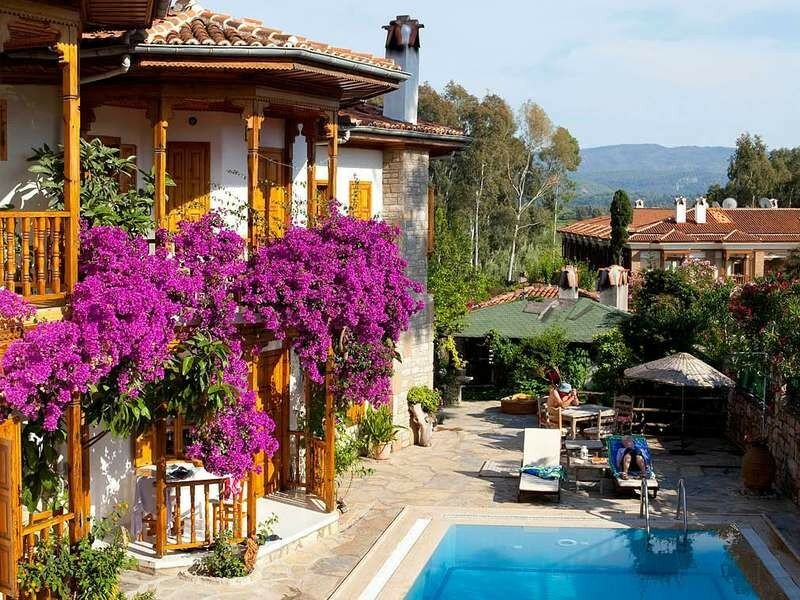 Toparlar is 32km from Akyaka. 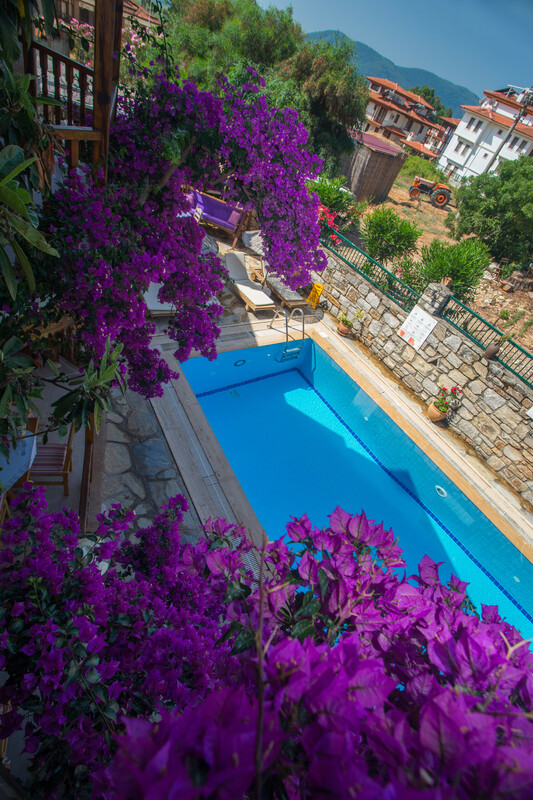 Practice your skills and start jumping, swimming, abseiling and walking down the canyon.Even though Akyaka is a wonderful place to just sit and do nothing, on occasions the urge may hit you to go explore further afield. Dalyan is a town in Muğla Province located between the well-known districts of Marmaris and Fethiye on the south-west coast of Turkey. The town is an independent municipality, within the administrative district of Ortaca. 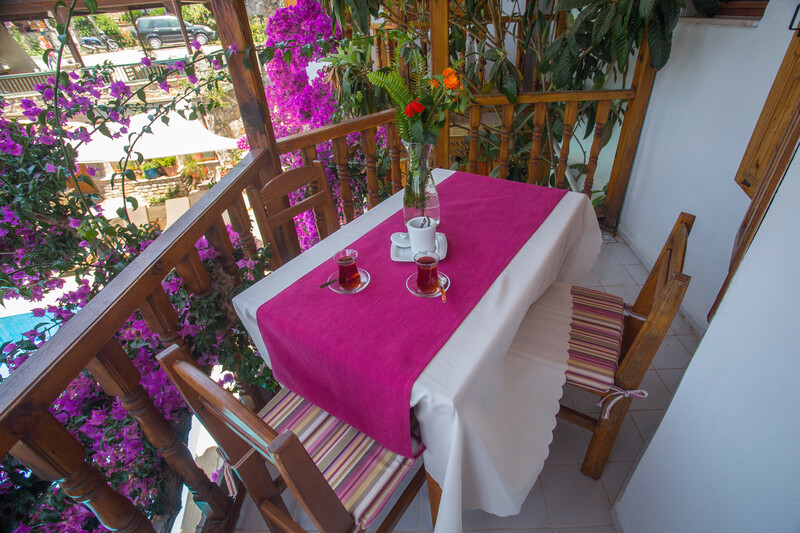 Life in Dalyan revolves around the Dalyan Çayı River which flows past the town. 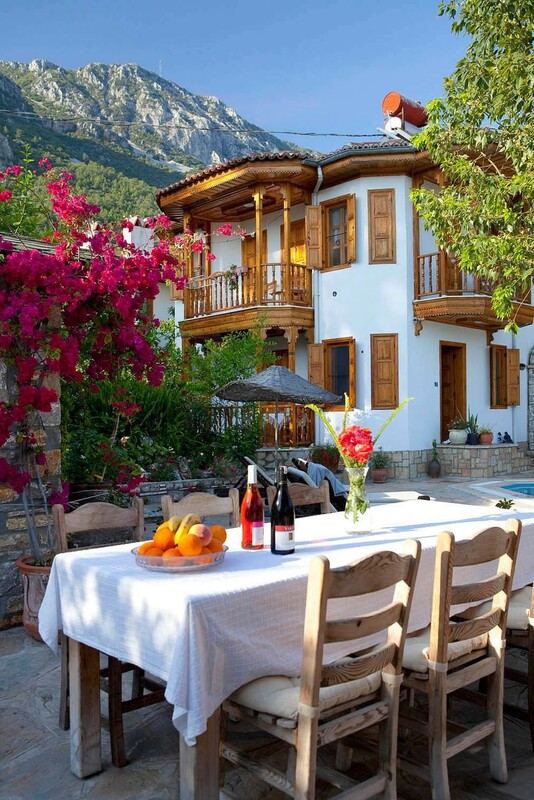 Above the Dalyan River's sheer cliffs are the weathered façades of Lycian tombs cut from rock, circa 400 BC. The ruins of the ancient trading city of Kaunos are a short boat trip across the river.